The word defun means, as you'd expect, that we're defining a function. The name of the function is describe-location and it takes two parameters: a location and a map. Since these variables do not have stars around them, it means they are local and hence unrelated to the global *location* and *map* variables. 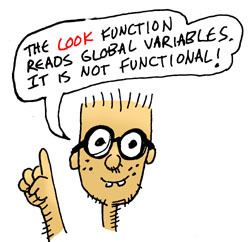 Note that functions in Lisp are often more like functions in math than in other programming languages: Just like in math, this function doesn't print stuff for the user to read or pop up a message box: All it does is return a value as a result of the function that contains the description. Let's imagine our location is in the living-room (which, indeed, it is...). You may be wondering if you can actually write any code like this that actually does anything useful, given these brutal restrictions... the answer is yes, once you get used to the style... Why would anyone bother following these rules? One very important reason: Writing code in this style gives your program referential transparency: This means that a given piece of code, called with the same parameters, always positively returns the same result and does exactly the same thing no matter when you call it- This can reduce programming errors and is believed to improve programmer productivity in many cases. Of course, you'll always have some functions that are not functional in style or you couldn't communicate with the user or other parts of the outside world. Most of the functions later in this tutorial do not follow these rules. So now it's clear: This function takes a list describing a path (just like we have inside our *map* variable) and makes a nice sentence out of it. Now when we look at the function again, we can see that the function "looks" a lot like the data it produces: It basically just splices the first and second item from the path into a declared sentence. How does it do this? It uses back-quoting! This "back-quoting" technique is a great feature in Lisp- it lets us write code that looks just like the data it creates. This happens frequently with code written in a functional style: By building functions that look like the data they create, we can make our code easier to understand and also build for longevity: As long as the data doesn't change, the functions will probably not need to be refactored or otherwise changed, since they mirror the data so closely. Imagine how you'd write a function like this in VB or C: You would probably chop the path into pieces, then append the text snippets and the pieces together again- A more haphazard process that "looks" totally different from the data that is created and probably less likely to have longevity. ...the eq function tells us if the symbol from the object location list is the current location. The symbol t (or any value other than nil) means that it's true that the whiskey-bottle is in living-room. ==> (YOU ARE IN THE LIVING-ROOM OF A WIZARD'S HOUSE. 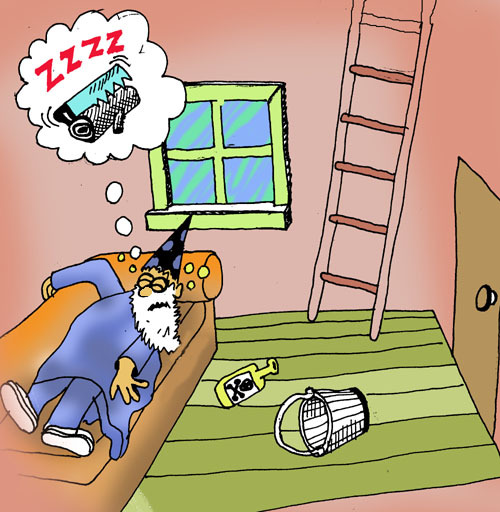 THERE IS A WIZARD SNORING LOUDLY ON THE COUCH. THERE IS A DOOR GOING WEST FROM HERE. THERE IS A STAIRWAY GOING UPSTAIRS FROM HERE. 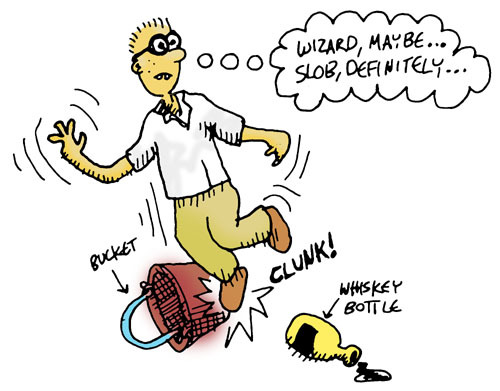 YOU SEE A WHISKEY-BOTTLE ON THE FLOOR.